As soon as the lights went down, the energy spiked way up – and that’s where it stayed throughout the night at Boca West Country Club on March 1. THE EVENT 2.0 may have been called Federation Unplugged, but the night ran on the spirit and power of the more than 500 adults of all ages who came together to celebrate our remarkable Jewish community’s commitment and generosity. For a fifth year, THE EVENT 2.0 brought Federation supporters together from across South Palm Beach County’s vibrant diversity, for one shared purpose: to celebrate all the good we do together and get inspired to do even more for those who depend on us. Once again, they cried and cheered as they heard compelling stories from people whose lives have been changed through their compassion and generosity. They heard from the evening’s co-chairs Kathy & Ken Green and Mara & Michael Shapiro, and from Campaign Chair Larry Feldman. And this year the audience was thrilled to welcome back home and to the stage Brett Ratner, a Miami Beach native who is now the sixteenth highest grossing film director in history with more than $1 billion in career box office sales. 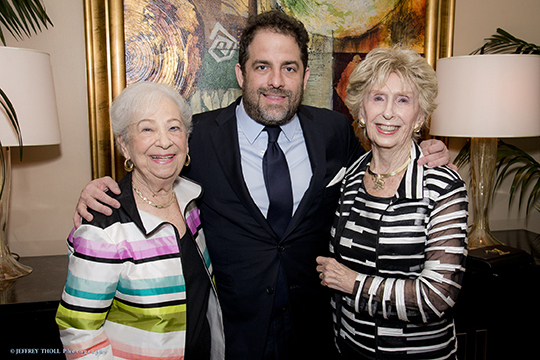 With his mother, his rabbi and his longtime mentor in the audience, Ratner fully lived up to his reputation for mesmerizing and inspiring audiences with his haimish journey from Miami dreamer to Hollywood mogul and action-packed, comedic delivery - as well as for his commitment to Jewish history, culture, values, security and philanthropy. THE EVENT 2.0 was generously sponsored by Bankier and Arlen Law Group, PLLC; Berger Singerman; Brown’s Interior Design; CBIZ MHM, LLC; Greenberg Traurig; Hotwire Communications; Life Care Services; The Mordis Group; Marsh & McLennan Agency; Suffolk Construction; and Virgin Printing Corp. Greenseid Catering, Southern Glazer’s Wine & Spirits and Zebedee were the event’s In-Kind Sponsor, and The Boca Raton Observer was Exclusive Magazine Sponsor.